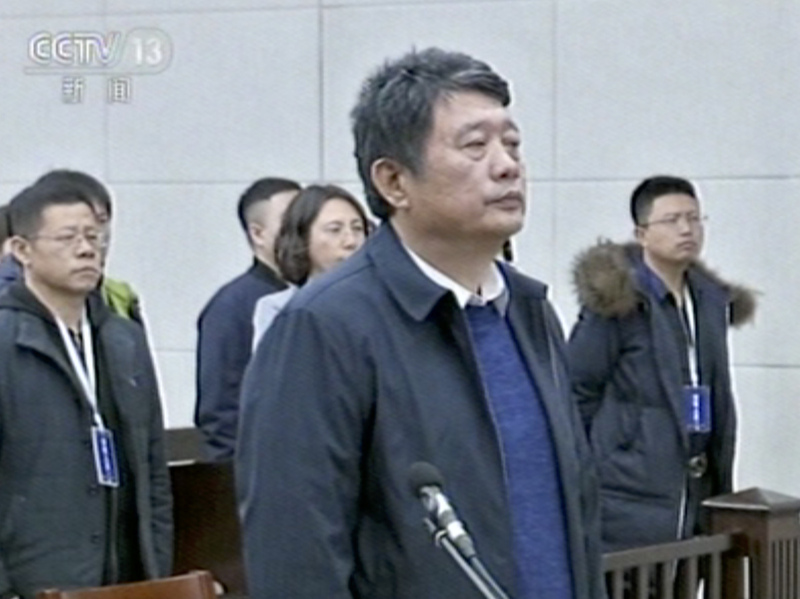 Former Head Of Chinese Counterintelligence Sentenced To Life In Prison Ma Jian, who served as vice minister of state security from 2006 until he was dismissed in 2015, was convicted on charges of accepting bribes and insider trading. In this image made from CCTV video, China's former deputy intelligence chief Ma Jian appears in a courtroom in the northeastern port city of Dalian, China. A former Chinese intelligence chief has received a sentence of life in prison on charges of accepting bribes and insider trading — becoming the latest official held to account as part of a massive crackdown on corruption under President Xi Jinping. Ma Jian, appointed deputy head of the Ministry of State Security in 2006, was convicted on charges spanning a 15-year period that began years before his appointment to the post that oversees Beijing's counterintelligence operations, according to sources quoted by The South China Morning Post. He was dismissed from his post in 2015 and placed under investigation. Ma was expelled from the Communist Party the following year. In addition to his life sentence, the Dalian Intermediate People's Court ordered Ma to pay a fine of $7.35 million. What Motivates Chinese President Xi Jinping's Anti-Corruption Drive? Ma's case is linked to New York-based real estate tycoon Guo Wengui, who requested asylum in the U.S. last year after he called out corruption in the Chinese Communist Party — something that did not sit well with party officials. As NPR's Rob Schmitz reported last year, Guo "was involved in a series of corrupt deals with members of China's ruling elite." Several of them, he added, were in jail — "and Guo would be too if he had stayed in China. Instead, he's safely ensconced in a $68 million penthouse overlooking Central Park in New York." The court said in a statement that Ma used his position to help Guo further his business interests, that he accepted the equivalent of $14.5 million in bribes and profited by trading stocks on inside information, the statement said. "The court also ruled that between 2008 and 2014, Ma and Guo colluded to force the sale of shares in brokerage firm Minzu Securities to Zhengquan Holdings to give the latter a controlling stake. Ma was also found guilty of providing insider information about the restructuring of Minzu and another brokerage house, Founder Securities Co, to his family members, who used it to make a profit of more than 49 million yuan [$7.1 million] from illicit stock trades."